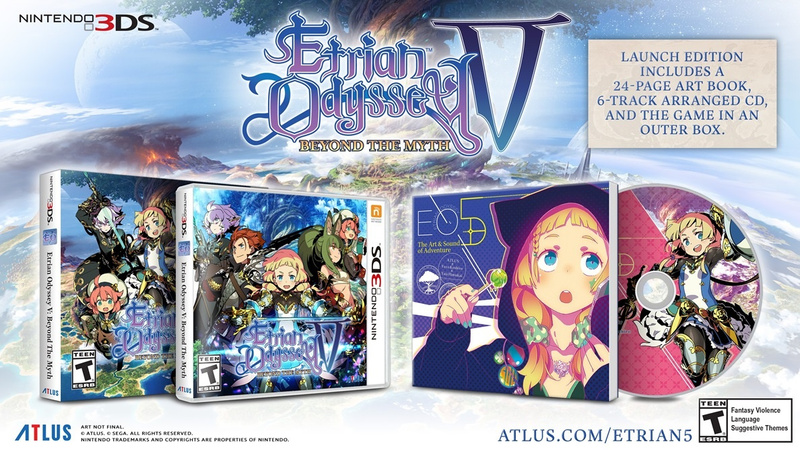 Plenty of 3DS fans have been looking forward to the arrival of Etrian Odyssey V: Beyond the Myth later this year, and those in North America now have a firm date - it'll arrive on 17th October priced at $39.99USD. The European release date will be announced "at a later time". In addition to that reveal, Atlus has also released a new trailer to showcase the Fencer class; check it out below. It just wouldn't be smart to traverse the Yggdrasil tree without someone who is pretty handy with a blade, so why not have an Earthlain Fencer watch your back when exploring? The Fencer is master of both rapier and shield, and let's just say that during fights they really like to get straight to the point. Quick on their feet, Fencers excel at evasion, stabbing, initiating defensive buffs, stabbing, chaining together attacks with other party members, and stabbing. They can further specialize in their agility by sacrificing unnecessary equipment for speed or go all in with their swordsmanship to become a whirlwind of pain. Is this on your 3DS wishlist? Looking good! It's not on my wishlist though, I've got enough on my plate. Of course I'm getting it though. I'll find the balance somehow. Oh Atlus I absolutely love love love how much you support Europe. @XenoShaun Chill. They said it'll come to Europe in 2017 too. @Spoony_Tech Seriously...how much time do they think we have?!?!?!?! I'll get it to though. OH MY GOD, IT'S ALMOST HERE! October is crazy. Etrian Odyssey AND Mario? With MH Stories, Metroid, and Danganronpa in September? What even is this year?! @Ralizah Feels like 2013 all over again only more EPIC!! I just sold a kidney to have a New 3DS pokemon 20th anniversary edition and to get MH Stories and Metroid 2. I'll get it eventually, when my kidney grows back. ... They do grow back, right? Neat, I'll have to pick this one up. Glad we've got a date. We still need an Etrian Odyssey 3 remake to keep the continuity going on the 3DS. @Spoony_Tech This is easily the best year in gaming since the turn of the century. Every month has been filled with wonderful surprises. Almost every franchise I love is accounted for. I got the home console I've always dreamed of. 2013 was definitely the best year for the 3DS, though. So many good games! @Elanczewski it just says the European release date 'will be announced at a later time', no guarantee we'll get it in Europe this year. It's on my wishlist, but it'll be tricky to find the time to play it. @ThomasBW84 I'm pretty sure it is $39.99 USD, not "£39.99USD"
Yeah, I preordered this the day they announced it. I'd say I'm pretty stoked. @TromaDogg Yeah, this news says so, but Deep Silver (publisher of Atlus games in Europe) announced some time ago that EO V will be released in winter 2017. They have 3 games to publish and I suppose they don't want to release them all in 2018. @roy130390 - Look, kidneys are just weird little filters that remove contaminants from our blood stream. Sell them both, and then just make sure not to absorb any contaminants. You should be fine. If you don't trust yourself not to absorb contaminants, simply sell your plasma and donate all of your blood. Win/win. Another sad victim to the market slaughterhouse that is Mario Odyssey. @HopeNForever It's been a long week. I tried so hard to like etrian odyssey but I can't play it. The map writing takes over the game and its tedious and boring. Can't wait. One of my last 3DS purchases too. Good times with the 3DS. Double the "stabbing" I see! But seriously this is great news. Hope EU hears something sooner than later! @scamander Thats good to hear. The Deep Silver / Sega partnership seems to be showing some strengths. Was really annoying we kept getting Atlus titles months and months later over here. Cool. Day one buy for me. I do love the Etrian series, it is perfectly suited to the 3DS. So this, MH Stories, Metroid, Fire Emblem Warriors and DragonQuest XI, (getting FE and DQ Switch too) are the only 3DS games left on my radar (maybe The Snack World if it's any good). I'm starting to wonder how much support the 3DS will see in 2018. I hope the European version comes with that artbook. @scamander I think you could right about the first party support. I would definitely pick up DQ Joker 3 and DQ Rocket Slime though, I loved Rocket Slime on the DS.